The one man on earth feared by the walking dead. 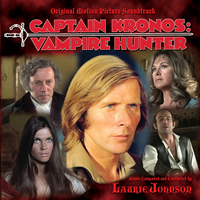 BUYSOUNDTRAX Records, in association with GDI Records, is proud to present the original soundtrack to the 1974 Hammer Horror classic CAPTAIN KRONOS, VAMPIRE HUNTER. The soundtrack features music composed and conducted by Laurie Johnson (THE AVENGERS, DR. STRANGELOVE, FIRST MEN IN THE MOON) for the 1974 cult classic written and directed by Brian Clemens (THE AVENGERS, DR. JEKYLL & SISTER HYDE, THE PROFESSIONALS). Set in Eastern Europe, in the 1600s, CAPTAIN KRONOS, VAMPIRE HUNTER stars German actor Horst Janson as Kronos, expert swordsman and vampire slayer, armed with a samurai sword, along with John Cater (THE AVENGERS) as his hunchbacked assistant, Professor Hieronymos Grost. They are joined by the First Lady Of Fantasy, Caroline Munro (GOLDEN VOYAGE OF SINBAD, AT THE EARTH’S CORE) as the beautiful Gypsy girl, Carla, whom they rescue from the gallows at the beginning of the film. Together, they must unravel the mystery of a series of deaths in the countryside that has left once young and beautiful girls old and withered in their demise. Boasting exquisite Gothic set design, rich colorful photography, impressive make-up effects, and a bevy of beautiful actresses, all in typical Hammer fashion, CAPTAIN KRONOS is augmented by a superb score by composer Laurie Johnson, featuring one of the strongest main title themes that still commands the attention decades later. Born in Hampstead, London, in 1927, Laurie Johnson undertook his musical studies at the Royal College of Music, where he would later return as a professor. He embarked on a professional musical career at the age of 21, composing and arranging for a variety of big bands, a love which continues to this day with his jazz ensemble, The London Big Band. Johnson began scoring films and television in 1956, and soon proved to have an affinity for quirky and fantastic films with his scores for Stanley Kubrick’s DR. STRANGELOVE (1963) and FIRST MEN IN THE MOON (1964). In addition, Johnson scored episodes of THRILLER and THE AVENGERS for television, including the latter’s popular title theme. Johnson also became associated with the legendary Hollywood composer, Bernard Herrmann towards the end of Herrmann’s career. The booklet contains liner notes written by noted author Randall D. Larson and a forward by Carla The Gypsy herself, Caroline Munro.